Wedding bells are ringing. Birds are singing. Mom and dad are smiling. Here are 9 ways to save money and still have a beautiful summer wedding. It would be a disappointing day to have to forego something special you’ve always dreamed about – such as a special centerpiece or – worse – your honeymoon because you wiped out your budget planning your big summer wedding. Tying the knot shouldn’t have to result in breaking the bank. There are many steps that you can take to save you – and your future spouse – some money on your summer wedding. Don’t start your life together in debt due to your wedding spending. Instead, check out these 9 money-saving tips for a summer wedding you can be proud of – without going broke. Ranking your priorities should be one of the first things you decide to do. 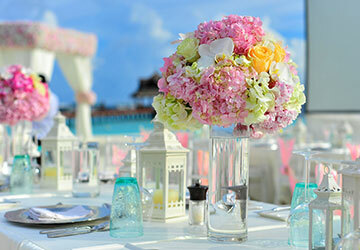 When you think of your summer wedding, what is the first thing that comes to mind? Is it the ceremony? The dance floor? The cake? Deciding what is important to you can help you decide where to spend your money. If you would rather have a big reception, then consider a small, intimate ceremony. If you really want to hire that live band, then serve a light, buffet-style meal. If you refuse to give up a phenomenal cake, then let that cake be the center of your decorations – and cut back on decorating. Put your money into what will make the day for you. You don’t have to have it all. Choosing what is important and making that shine while cutting back on other wedding expenses will save you money. Flowers in season are much cheaper than flowers that are not. If you’d like to save yourself some money, then opt for flowers that are naturally blooming in summer. For example, sunflowers, hydrangeas, daisies, orchids, and lilies. There are many others, too, so you will have a lot to choose from. Have ceremony and reception in one location. Having your ceremony and reception in two separate locations means more money. Not only could you incur venue rental fees, but you will have to secure transportation, decorate two places, and so much more. Save yourself (and your guests) the aggravation – and save yourself some money – and have the ceremony and reception in the same location. Choose an officiant that you know. When you look back on your wedding, are you going to want that strange guy you don’t know to officiate your most precious moment? Or, would you prefer your best friend or your favorite uncle? Most states allow individuals to very quickly become official, either using an online ministry service or if your state allows it, a Notary Public. Not only will this route save you money, but it will also make it more special. Rent a tent for your summer wedding. Avoid renting a hall. Instead, rent a tent. First, you will have more options for locations and can choose the one that works best for you and your needs – and the size of your tent. Second, a tent rental means that you won’t be required to use the facility’s vendors because, well, you are not renting from a dedicated venue. Lastly, your tent gives you a wide open, blank space to create the summer wedding of your dreams. No walls to work around or crazy layouts. It will give you the opportunity to create the perfect spot. Spend some time making your homemade wedding favors and you will find you are saving yourself some big bucks. You don’t have to go big with favors. Instead, use your printer to create stickers or labels and add them to something small, such as a small potted herb (grow together) or a small pack of coffee beans (love is brewing). Use your imagination to make it memorable. Use the outdoors as your décor. Many people spend a lot of money decorating for their wedding. They want to get just the right look and just the right vibe. What if you could minimize all that decorating and still end up with a magnificent view? All you need is to take your summer wedding outdoors. And no need to worry about the weather ruining your special day. You can rent a tent with clear panels. This keeps your view clear, protects you and your guests from Mother Nature, and it saves you from paying venue rental fees. Wedding vendors know that you want the perfect day and they know you’ll pay for it. You will find that you can save money if you think outside the box. For instance, instead of seeking out a florist or bakery that specializes in weddings (where you may end up paying a small fortune), visit your local grocery store. Order your flowers and cakes through them. You will get what you need and save money. After all, their specialty is selling groceries – but that doesn’t mean they don’t make incredible cakes. Give a newbie a chance. We all have to start somewhere in life, don’t we? That includes those who are photographers, caterers, event planners, etc. Yes, you want the best for your wedding day – and you can still get it. However, give that new photographer a chance. You will save money and have the satisfaction of knowing you helped someone take a step toward filling their dreams. Of course, if you are nervous that your pics may be lacking, you could also create a hashtag and have your guests take photos throughout the event, too. That way you will get photos from all sorts of angles – capturing your memories for you. A summer wedding can be expensive, but, they don’t have to be. You can have a day full of magic and not feel like you have missed out on anything. You just need to do a little planning –prioritize your spending, take advantage of outdoor décor, and rent a tent to have your ceremony and your reception. Let your wedding day whisk you away without going broke.